I can’t imagine living a real life, or how I’ll ever be an adult. It seems like such an unlikely transformation. Someday I may be someone’s partner or someone’s mother or someone’s forensic pathologist. Someday I may drink too much or have a child I never tell anyone about. Someday I might run away from everything, for reasons of my own. That me is impossible for present-me to imagine. I cannot picture me grown up. I cannot picture me any different from the me I am now. I cannot picture me old or married or dead. Picture Me Gone is about a journey: twelve-year-old Mila and her father, Gil, are planning to go to American for Easter break to visit Gil’s best friend, Matthew. However, shortly before they’re due to depart, they receive a phone call: Matthew has left home, leaving his wife, young son and dog behind, and is nowhere to be found. Suzanne, Matthew’s wife, asks Gil to come anyway, as he’s best positioned than most to uncover the whereabouts of his oldest friend. And so begins a trip during which Mila tries to make sense of the complex world of adult’s secrets and hidden hurts. First things first: Picture Me Gone is an absolutely amazing book. The more I think about it, the more I become convinced that this is Meg Rosoff’s best work to date — and those of you aware of my undying love for her novels will realise that I wouldn’t make such a statement lightly. It’s perhaps easy to get the impression, from the plot summary above, that Picture Me Gone is fast-paced and suspenseful and all about the mystery of Matthew’s disappearance; but in reality this is a very quiet and introspective sort of story. It’s true that I couldn’t put it down, but not for the reasons you might imagine. While there is a mystery of sorts, what really makes it work is Mila’s emotional journey, rather than the answers that she finds or fails to find at the end. The other thing that makes Picture Me Gone so brilliant is Mila herself, and especially her narrative voice. I have a feeling Mila is the kind of young narrator people might describe as unrealistic, but I’m suspicious of that description for the same reasons why I’m deeply suspicious of the idea that John Green’s teenage characters are too smart to be believable. Even if I were to accept that smart, sophisticated young people are the exception rather than the rule, there’s no reason why fiction should be dominated by averages. We don’t expect adult characters to be representative of every single adult reader, and so the same standards should apply to other age groups. None of this is to say that there isn’t also a need for less readily articulate young narrators (a point I’ve made before), but we can express a desire for different voices and perspectives without calling into question the believability of smart young characters and running the risk of sounding patronising in the process. Having said all this, I don’t actually think that Mila defies credibility. She describes herself as having the ability to make sense of emotional cues in the same way a dog makes sense of scents when it enters a room, and there’s something a little magical about her talent for empathy; a little reminiscent of descriptions I’ve seen of Will Graham in Hannibal. But the reason why she rang so true to me nonetheless is that her intelligence and perspicacity are coupled with great emotional vulnerability. I don’t think this combination is uncommon for smart people around her age: I’ve seen in a good friend’s children, and in some of the amazingly bright 10-year-olds I have the good fortune to work with. Mila is a perceptive child in the process of making sense of adult emotions; of learning that the world is “imperfect, dangerous, peppered with betrayals and also with love” (but also that “we are all woven together, like a piece of cloth, and we all support each other, for better or worse”). Her knowledge of these imperfections is constrained by the limits of her experience, as she herself acknowledges, and being able to understand adult’s lives up to a point but no further leaves her exposed to nagging fears and doubts. At one point she asks herself, “How am I supposed to know what adults are capable of?”. So she worries: about her own family; about her parents' secret feelings and the sides of their lives that don't include her; about the future; about who she’ll become when she fully enters the complicated world of adulthood; about the challenges and losses life has in store for her; about the possibility that everything will go wrong and she’ll become as weary and defeated and weighted down by sorrow as some of the adults she sees. There are things I consider in the deep dark of night; secret terrors. Why are they secrets? I could easily tell either of my parents how I feel, but what would they say? Don’t worry, darling, we will do our best never to die? We will never ever leave you, never contract cancer or walk in front of a bus or collapse of old age? We will not leave you alone, not ever, to navigate the world and all of its complexities without us? They will leave me. It is the first thing you learn that makes you no longer a child. Someday I will die too, but I’m not nearly as frightened of that as I am of being left alone. This is my darkness. Nothing anyone says can console me. I would hate to have parents who were always looking over my shoulder, reading my diary, checking my thoughts. I would hate to be exposed. And so, perhaps, when I say I long to be a pane of glass, I am lying. I long for partial obscurity at the same time as I long for someone to know me. The above perfectly captures the emotional tone of Picture Me Gone, by the way, so if you find it as gorgeous and moving as I do make sure you pick up the book. Picture Me Gone made me cry a lot, but not over any single scene or tragic event. Although I’d describe it as melancholy, it’s not a dramatic sort of book. The tragedies and hurts it deals with are in the past, and so the focus is more on long-term repercussions and enduring emotional wounds. But there’s just so much about it that is beautiful and thoughtful and emotionally resonant. Also, it features Honey, my new favourite fictional dog, and a character whose presence in the story says so much about the various facets of love. And oh, I haven’t even said anything about Mila’s relationship with her father, which is one of my favourite aspects of Picture Me Gone, and which is at the very heart of the story. Mila’s parents are among the coolest I’ve ever encountered in a novel (her mother stays in Europe when they travel, but what we see of her through phone calls and Mila’s thoughts is awesome too), but this isn’t to say they aren’t fallible. And coming to terms with this fallibility is a crucial part of Mila’s emotional journey. 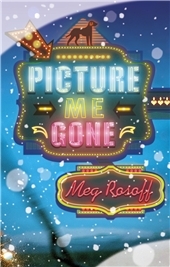 So: I adored Picture Me Gone, and hopefully I’ve managed to explain why in this post. What I’m about to say doesn’t detract from that, but I feel it’s important to say it anyway. There was something about the novel that kept pulling me out of the story at first; that almost made me give up on it before I got far enough into it to realise how much I loved it. Here’s the problem: Mila’s father, Gil, is of Portuguese descent. He grew up with several languages, of which Portuguese is one, and he works as a Portuguese to English translator. In addition to this, he has a degree in applied linguistics. Because of his family background, he endearingly calls his daughter “Perguntador” (“asker of questions”), and thus this is a term that’s used repeatedly throughout the novel. In Portuguese, like in many other Romance languages, nouns and adjectives are gendered. I want to make it clear that this isn’t something akin to the distinction between “poet” and “poetess”, which potentially reads as patronising and has fallen out of use; it’s something that’s strongly embedded in the language’s grammar, and therefore misgendering words feels deeply wrong to native speakers and other proficient language users. When you adopt a nickname for a girl or woman, you use the feminine form by adding an “a” to the end of the word. Someone with the expertise Mila’s father is supposed to have would certainly have known this. He would never have called his daughter “perguntador” rather than “perguntadora”. The reasons why this bothered me go beyond it sabotaging my suspension of disbelief and undermining my belief in Gil as a character, although the recurrent error did do both those things. But it also felt alienating in the way someone writing about your language and culture and getting it wrong inevitably feels alienating. Now, as someone who stands slightly outside of cultural hegemony but still has a ton of privilege, I want to make sure I explain this very carefully. Obviously my standing as a Western European in the English-speaking world is not one of marginalisation, and the last thing I want to do is to appropriate the experiences of truly disempowered groups. I don’t know what it’s like to be a PoC and come across a racist stereotype in a book I’m reading, for example, and this is not something I’ll ever really understand. So my sense of alienation is obviously relative and tiny in comparison to many other things, but all the same it’s still there. Coming across a character who shares your background but makes a mistake like that makes you feel that you, the kind of reader who would know better, the kind of reader with the expertise the character is supposed to have, aren’t important enough to be worth the effort of getting it right. I do of course realise that this is ungenerous: the explanation for why mistakes like this happen is likely to be far more complex than that. But still, this is what it feels like, from this to Speaker for the Dead to my beloved Journey to the River Sea, and unfortunately emotional reactions aren’t always affected by knowledge and logic. It’s not a nice feeling, and not one I want to associate with stories I otherwise love. The good news is that, the Internet being the small world that it is, Meg Rosoff has been made aware of the error, which means it’s likely to be corrected in future editions. Three cheers for that. The actual running away does not strike me as particularly strange. Most of us are held in place by a kind of centrifugal force. If for some reason the force stopped, we might all fly off in different directions. But what about the not coming back? Staying away is frightening and painful. And who would leave a baby? Even to me this seems extreme, a failure of love. So far, nothing earth-shattering has happened between us, but just talking about anything can be big when you’re on the same wavelength. I’ve noticed that the magic of getting on with someone isn’t really magic. If you break it down, you can see how it happens. You say something a bit offcentre and see if they react. If they get it, they push it a bit further. Then it’s your turn again. And theirs. And so on, until it’s banter. Once it’s banter, it’s friendship. Well, I say at last. At least he has Honey. Yes... Gil draws out the single syllable and looks at me. But Honey’s a dog. He says this as if it’s something I’ve failed to notice, but I can see what he’s thinking: a dog isn’t the most important thing. And I think, OK. So a dog isn’t the most important thing. But a dog like Honey loves one person completely, unwaveringly, with perfect faith. That has to be more important than most things. People don’t like talking about the bits of life that don’t add up. The bad stuff. The mistakes. Do you think he felt guilty? Have you done things you can’t talk about? I suppose I have, Gil says. But not lately. And no other children that I know about. You can stop worrying about that at least. I’m not, I say. But maybe I am. How am I supposed to know what adults are capable of? Gil doesn’t like Suzanne much, which is understandable, because in my opinion, she’s not very likeable. But the more I hear about Matthew, the more I think it’s not so simple. Maybe Suzanne was fine before she hooked up with him. I haven't read anything by Meg Rosoff, but I will now! I totally agree with you about the "unrealistic" character bit. I get irritated when people say a child in a book is "too smart" for their age. My daughter is a very smart, very mature 12-year-old, and those kids always feel realistic to her. They are characters she can relate to. Also, why should writers be expected to dumb kids down in books (or talk down to them)? We don't like that as adults, and I know I didn't like it when I was Ashley's age. I'm glad you said something about that here. Great review. I absolutely loved How I Live Now, and if this is better, then I have no choice but to read this. She has such a way of capturing the heart and soul of a smart young adult. Nothing drives me crazier than when these types of characters are dumbed down. Granted, since I have two teenagers in my house, I have exposure to plenty of bumbleheads that seem to have lost their brains in the maturing process. But at the same time, I'm constantly shaking my head at some of the things I hear coming particularly from my son's crowd of friends. They are wise beyond their years, and whip smart. It is amazing, and I love that this is captured in Meg's, or John Green's, books. I know zero Portuguese. But even I immediately react to that, because grammatical gender, people, it is a thing, in very very many languages and especially the Romance ones and, like, failing to know that somehow speaks of the arrogance of the English-speaking world and how a lot of people seem to arrogantly think that other languages are just like English just with different words and it really, really isn't like that and somehow this misconception makes me really really angry because it's just so arrogant and lazy. And now I am torn, because the book sounds amazing, but that would make me throw the book at the wall in anger, so... Wait for the second edition where it's hopefully corrected? That error is depressing - it's like going to Google Translate and expecting the word that comes out to be appropriate Portuguese, never thinking to ask an actual Portuguese speaker. :/ It seems like an error that someone who only speaks English would make (speaking as someone who unfortunately only speaks fluent English). I do hope it's rectified in future editions. That aside, I think this book sounds actually perfect. That quote at the top? I had actual musings as a young teenager that matched that perfectly. I couldn't see how I would ever become an adult. I was sold on just that paragraph, and now that I've read the rest of the review (and really love Meg Rosoff) I really need to read this. Aw, I'm sorry the Portuguese was wrong. Of course that would take you out of the story, and it's completely reasonable to mind. I feel absolutely wrathful when somebody hasn't bothered getting something right that's important to me. Often for me it's movies about the South -- they make me want to bite, even when the movies are otherwise good. I've been waiting for something anywhere near as good as How I Live Now. Maybe this is it. I couldn't resist buying this book last week, and from your review it sounds as though I have a treat in store. Great review - I like your comments about smart young narrators in particular. Well said. It breaks my heart that one of your favorite authors left you feeling alienated. :( I guess it's a good thing that you're a bigger person than I (because I'm not sure whether or not I would have continued reading had I been in your shoes) because I can tell how much you adored this book otherwise. It sounds positively wonderful, in that deep and meaningful way. In fact, this is one more instance where you didn't just make me want a book--you made me physically crave it. I don't know how you do it, but you always make every book sound un-missable. And now you've DONE IT AGAIN, with an author that I do not totally love. But I just can't resist your review, and now I know I am going to read it. Also, the "perguntadora" thing would bother the heck out of me if I even spoke Portuguese, much less if I were a native speaker. No need to explain! It explains itself, and I am amazed that this obvious error made it into even the first edition. Based on your review, I need to get my hands on this one. I've only read one book by this author, but it made a lasting impression and even improved on a second reading.